David Moores was sworn in on the 13th June 2018. 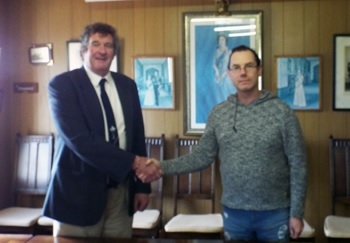 David Moores was sworn in by Sean Burns on Wednesday 13th June 2018 to serve as Acting Administrator while Sean is off the island. 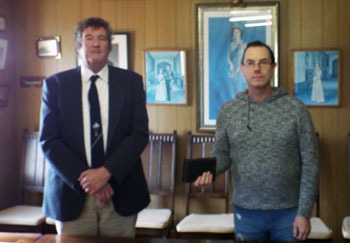 Sean Burns and David Moores (holding the Bible) at the swearing in ceremony. Sean Burns congratulates David Moores on his appointment as Acting Adminstrator.